A major chronic illness plaguing our modern world is obesity. It is fast emerging as a health epidemic around the world. A more severe form of obesity is called morbid obesity. Obesity results from excessive accumulation of fat that exceeds the body’s skeletal and physical standards. Many players contribute to obesity. Our Genetic Make-up plays a major role in gaining excess weight. It determines our “susceptibility” or “risk” of becoming overweight or obese. Our metabolic rate (how efficiently our body utilizes and burns calories) decides how prone we are to gaining weight and it depends a lot on our genes. Morbid obesity is typically defined as being 100 lbs. or more over ideal body weight or having a body mass index (BMI) of 40 or higher. It is a chronic disease, meaning that its symptoms build slowly over an extended period of time. Morbid obesity can lead to the development of what are known as “co-morbid” conditions. 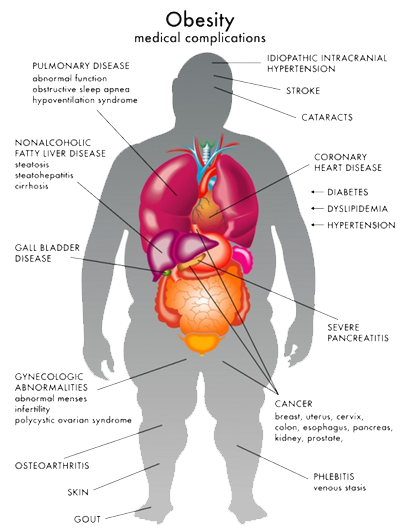 These are serious health issues that arise directly from the severe degree of obesity. Excess body weight keeps the heart from working properly. The result can be high blood pressure (hypertension), which can cause strokes and heart and kidney damage. Known as the wear-and-tear kind of arthritis, osteoarthritis is a chronic condition in which there is a breakdown of a joint’s cartilage. For anyone with morbid obesity, the excess body weight placed on joints, particularly knees and hips, results in rapid wear and tear and pain caused by inflammation. Similarly, bones and muscles of the back constantly are strained, causing disc problems, pain and decreased movement ability. Depression is an illness that involves the body, mood and thoughts. It affects the way a person eats and sleeps, the way one feels about oneself and the way one thinks about things. There are many reasons people with morbid obesity experience depression. Many of the everyday activities people with healthy body weight take for granted are big challenges for a person suffering from morbid obesity. Obstructive sleep apnea is when breathing suddenly stops because soft tissue in the rear of the throat collapses and closes during sleep. The greater your excess body weight, the greater the amount of fat pressing down on your chest and lungs. Gastroesophageal reflux disease is injury to the esophagus caused by chronic exposure to stomach acid. While the symptom of heartburn is often associated with this disease, GERD is a serious disease that can cause esophagitis, Barrett’s esophagus and esophageal cancer. Among women, morbid obesity is a big risk factor for urinary stress incontinence, or uncontrollable urine loss. A large, heavy abdomen and relaxation of the pelvic muscles due to morbid obesity may cause the valve on the urinary bladder to weaken, leading to leakage of urine with coughing, sneezing or laughing. Reproductive health can be a concern for women struggling with morbid obesity. Issues such as infertility (the inability or reduced ability to produce children) and menstrual irregularities may occur due to morbid obesity.